Happy Wednesday and hello pink! For being a girl that pretty much never wore pink...ever!, I have been slightly obsessing over bright hot pink shades this summer! It is especially fun to pair with fun prints and other bright colors. I guess I can no longer say that this girl doesn't wear pink, and I'm not even mad about it. Have a great hump day, and as always, thanks for reading!! this hairstyle is amazing! can you do a tutorial for it?! LOVE that dress and that blazer together! Such a cool look! This is such a fun look! You look gorgeous as usual. Your hair looks amaze! Love the whole look! Such a bright, fun outfit! Love this! 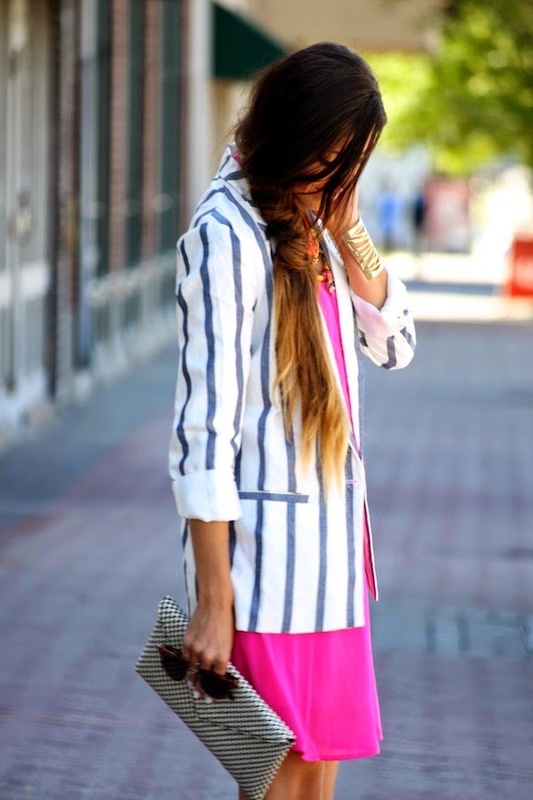 That striped blazer is amazing! I am so in love with those heels!! AH perfect!